Inversion presents an overall sculptural installation which is at once entertaining, visually striking and disconcerting. The overall four site installation employing both bronze and brushed stainless steel combines both the historical and the modern. 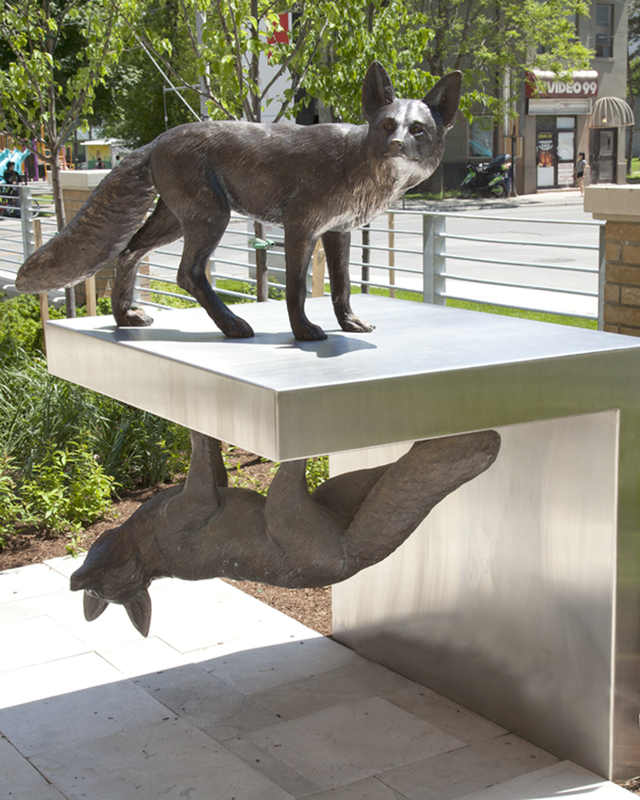 The multi-sited sculptural work, Inversion is a comment about our current, local relationship with this age old Canadian and particularly urban interaction with nature. Simply put, nature has now been turned on its head. The threat has gone, the desire is not to fortify our existence against the wilderness which has been tamed to disappearance, but rather, it is now a nostalgic desire to embrace what no longer exists. 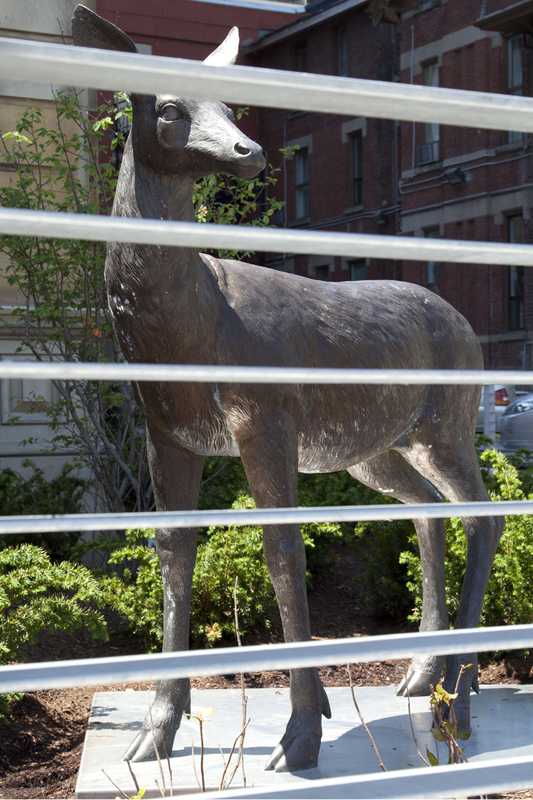 The animals represented as realistic sculptural renderings in bronze are intended to invoke a pastoral past, inverted. 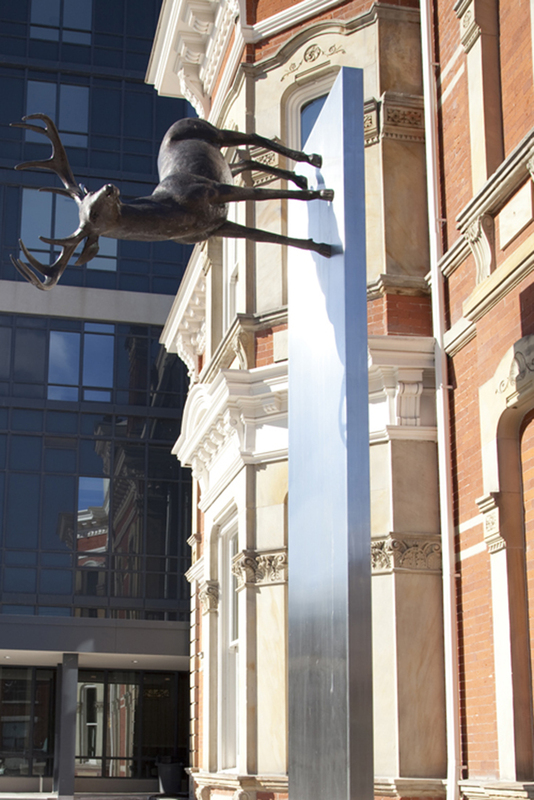 The stag positioned vertically, fastened to a stainless steel support structure, is at once a symbol of strength and a symbol of nature’s replacement by man’s ingenuity and modern invention. The two wolves, the one upright, the other inverted and mirrored, elevated on their stainless steel tower simultaneously guard and welcome. The female deer, the doe, the only one of the animals represented sited at ground level, on a flat stainless steel plate, calmly, peacefully invokes an idealized past and an comfortable presence. 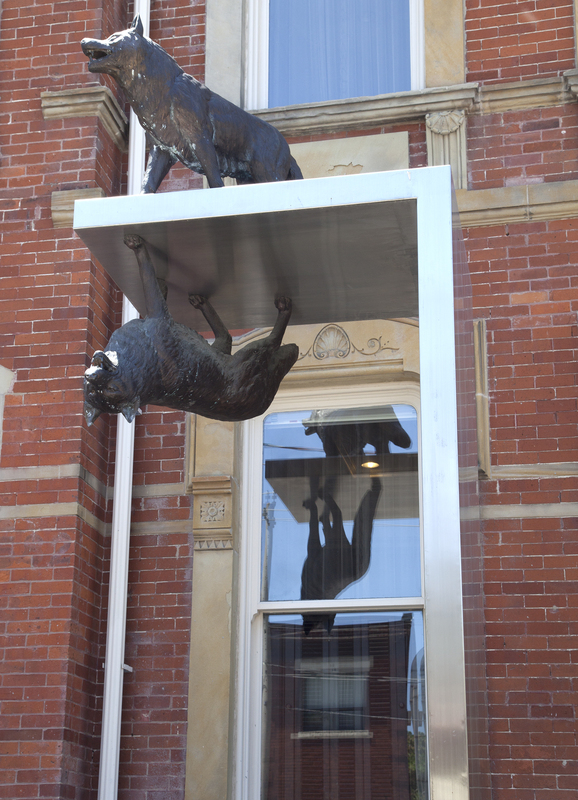 The foxes are sited close to the doors of the building at pedestrian level, they are intended to be interacted with visually and tactilely, literally available to be petted. The foxes are not merely shadows of one another, but are turned around creating an unsymmetrical reflection, a personification of a life effused with humour and goodwill. All animals are life-size bronzes. Supports are constructed from stainless steel, 6” thick with a width of 48”.